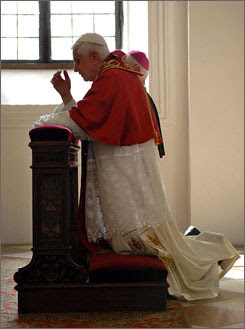 Considering my last post, The New Liturgical Movement’s, Shawn Tribe offers a timely translation of Archbishop Malcomb Ranjith’s (Secretary of the Vatican’s Congregation for Divine Worship and the Discipline of the Sacraments) forward to the book Dominus Est by Bishop Athansius Schnedier, who analyzes the question of communion received kneeling and on the tongue. Then there are those who abuse takes away the sacred species to keep them as souvenirs, those who sell, or worse yet, who take them away to desecrate it in Satanic rituals. Even in large concelebrations, also in Rome, several times the sacred species has been found thrown onto the ground. UPDATE: The consecrated host offered for bid has been removed. 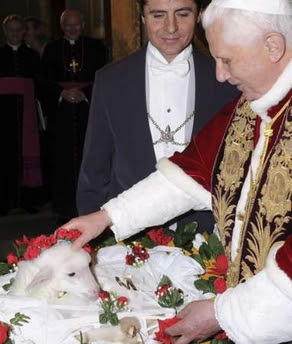 Pope Benedict blesses a lamb during the feast day of Saint Agnes at the Basilica Sant’Agnese in Rome January 21, 2008. The Spirit of V2 in a bottle. BTW: Expiration date says 070707. 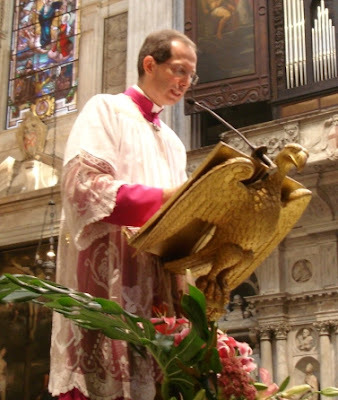 A succinct raison d’et of the Benedictine liturgical reforms has been uttered by papal Master of Ceremonies, Msgr. Guido Marini in an interview on Radio Vaticana. Thanks to Fr. Z for directing us to this insightful opinion piece in the UK’s Catholic Herald. There is a bewildering array of American Catholic blog sites these days. Some are liberal, but the overwhelming majority seem to express an ever-more confident Catholic orthodoxy on matters of faith, morals and liturgy. Many of the posters seem to be young, and take an apparent delight in winding up that generation of post-Vatican II Catholics still moaning about not getting their way in the contemporary Church. One particular American blogger, Fr John Zuhlsdorf, has recently hailed what he calls “the return of triumphalism”. Ever since Vatican II this has been a taboo word in the Church, but he sees it as a good thing. Is this yet more evidence that we are moving into a new, more confident era for the modern Church? That Catholics are more and more prepared to stand up for their identity and their core values? That liberal secularists and liberal Christians have failed in bullying orthodox Catholics into submission? Is it really time to become assertive about the faith in the public square? To be honest, there is nothing particularly serious, scholarly or analytical about Fr Zuhlsdorf’s site. There is, however, a knowing lightheartedness in appearing to indulge some guilty pleasures. 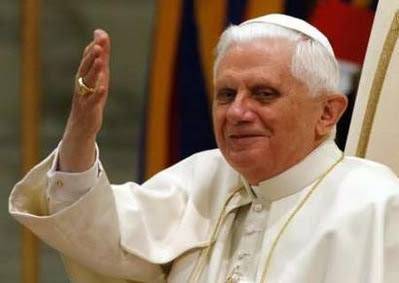 He is in raptures about recent liturgical developments in St Peter’s, and that “more and more, Pope Benedict’s intentions are being clarified in regard to the Church’s traditional liturgical expressions”. There is great enthusiasm for the increased reappearance of Gregorian chant, flappable excitement at the use of the correct, ornate vestments, and at the good taste of medieval images of Mary chosen for the ceremonies. The Holy Father is hailed for his “dedication to formal liturgical ceremony and also popular devotion, which is also of great importance in the life of the Catholic people. They strengthen each other, and the Holy Father understands that. “He is giving a good example as Bishop and chief pastor of Rome to his city and to the world… his way of showing the bishops and priests of the world how this is to be done”. Confident, assertive, provocative stuff. It is not just in the liturgical sphere that we see a new impatience with the comfy laxness of the previous generation. For many years successful professional Christians have sought to ingratiate themselves with their liberal secular associates by playing down the parts of the Church’s teaching that caused most offence. Nevertheless there was more at stake here than just their incorporation into trendy sophisticated company. Secular liberals have gladly gobbled up all these concessions and now want more – the complete obliteration of religion from public life. In the process liberal Christians have lost the respect of their secular peers. They gave no indication of intellectual rigour or ethical integrity in their eagerness to ditch bits and pieces of the faith. Their faith has been caught in a cruel light – their Christianity is bland, sentimental and anaemic. History will look back unkindly on the generation of Vatican II Catholics who were handed such a precious pentecostal gift of grace – a unique opportunity to purify the Church, only to squander it disastrously. They bent over backwards to accommodate the zeitgeist, rather than open a generational heart to the Heilige Geist. This is not what John XXIII foresaw when he inaugurated his great reforming council. He would have been horrified to see how many Catholics fell prey to the trendy nihilism of the 1960s, duped by a destructive iconoclasm which has eroded so much of the West’s culture and morals. This is the basis of the new positivist impulse among young Catholics, disdained and dismissed by some of their elders as conservative and reactionary. In the new generation, we need to rediscover the optimism that lay at the heart of Vatican II. We need to confront the radical dissatisfaction that led many 1960s Catholics to turn away from or against the Church. We need to challenge their disdain for tradition and that smug superiority that many Catholics of a certain age display towards the deep pieties of the ordinary, “old-fashioned” faithful. Catholic liberalism has had its day, and the legacy of Vatican II requires us to understand the pernicious, corrosive effects of the pick-and-mix tendency. The recent experience of our sister faith communities in the Reformed tradition has shown that those who strive to make their churches “acceptable” to the prevailing, but probably transitory zeitgeist, have triumphed. There are those, within and without the Catholic Church, who have been encouraged by this and are forever pushing in the same direction. They see no problem in being fully communicant while urging the rejection of the most precious doctrines on faith and morals. This rejection can sometimes cover the divinity of Christ Himself, can involve a campaign to legitimise abortion and euthanasia (there is an organisation in America called Catholics for a Free Choice), and the defeatist acceptance of the sexual hooliganism which has so harmed the position of marriage and the family in modern life. The western world’s love affair with self may have taken off in the 1960s but it will only get worse. The Catholic Church must provide a counter-cultural challenge to this, and offer the alternative of Christ’s own way. It is not triumphalist to say this, but it requires the Church to be happy and confident in its own skin. Catholics need to know what it means to be Catholic – to understand what our core values are, and to feel they are not just worth defending, but worth proclaiming from the rooftops. 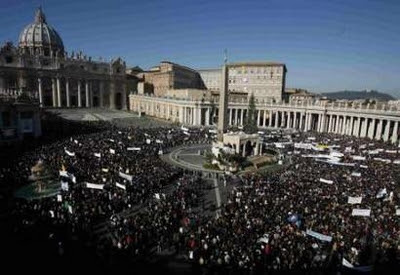 The young generation of Catholics are right to be assertive about our beliefs in the public square. If we do not speak boldly and honestly to power in these contexts, if we run scared in the face of the new anti-religious elites, we will be expelled from the public square, never to return. Perhaps American bloggers like Fr Zuhlsdorf know this. Our British reserve can make us cringe with embarrassment in the face of such brash self-confidence, but we may have to develop our own ways of being assertive. We can begin with the liturgy. Nothing signals the weakened state of the modern Church more than the contemporary practice of Catholic liturgy in hundreds of churches throughout the land. A breath of fresh air is wafting through St Peter’s, and in his own gentle way Pope Benedict is inviting the universal Church to taste the beauties and spiritual sustenance of true Catholic worship. I am convinced that from the liturgy everything else will flow. We British don’t flap with excitement, but there may be good reason for us to pray for Christ’s Church with a warm glow of expectation and confidence as we look with hope to the future. When the priest-celebrant faces the altar, he looks like what he is: the leader of a community at prayer. Everyone is facing the same way; everyone is involved in the same action. When the priest faces the people, on the other hand, he appears to be a performer, with the people as his audience. When priest and congregation face in the same direction, toward the altar, their posture reflects the unity of the Catholic community at worship. When they face in opposite directions, with the priest facing toward the people, that unity is broken. Liturgists refer to the usual posture for Mass today as versus populum. The Latin phrase sounds as if the priest is in competition with the people, and sometimes I think that is true.